There is nothing more distressing that losing a cat. 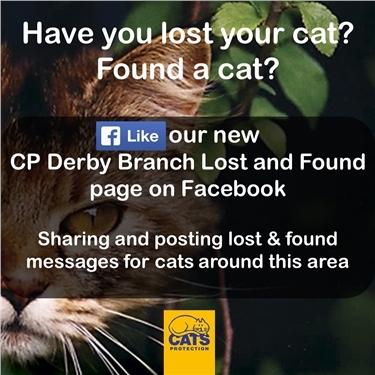 They can go missing for lots of reasons and our friends at Derby branch like to do as much as they can supporting owners in trying to find their missing pet. Whilst they cannot go out physically searching they will give advice and help with online appeals. The lost and found register has been in operation for many years but they are now embracing the power of social media by creating a dedicated page on Facebook to centralise lost & found stories in and around the Derby area. Their dedicated team of volunteers spend hours trawling through online sites trying to match up 'stray' cats with missing ones and this will be another valuable resource for the team. If you are a Facebook user please like this new page and join the community of cat lovers all wanting to help reunite these missing and found pets. Click here to go directly to the page.